In a blender, blitz Goulburn Valley Peaches into a puree. Soak gelatine in room temperature water for 5 to 7 minutes. Meanwhile, heat a medium saucepan over medium heat. Place milk, cream, sugar, cinnamon, vanilla beans and pod. Whisk until bubbles form around the edge, remove from heat. Squeeze excess water from gelatine sheets and whisk into mixture. Stir in 1 cup peach puree. Fill 6 ramekins or moulds of your choice and put in the fridge to set for at least 4 hours or up to 24 hours. 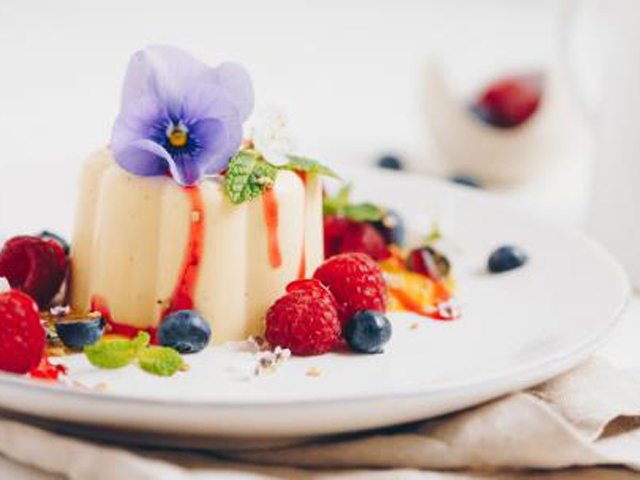 When set, turn out the panna cotta onto serving plates and serve with the remaining peach puree, berries, strawberry sauce and edible flowers.